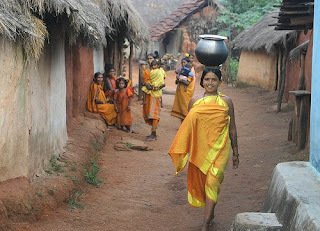 According to the Census Report of 1991, around 22% of the total population of Orissa is comprised of tribal communities. These communities are sixty-two in number. 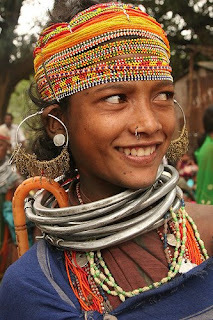 Being very religious minded, these tribes celebrate a number of tribal festivals in Orissa. The rituals and festivities that are a part of these tribal celebrations provide a window to the age-old customs and traditions of tribes in Orissa. Some of the most popular tribal festivals celebrated in the state are as follows. The Koraput tribal communities of Orissa celebrate Bali Jatra festival on the same day as that of Karama Festival. The festival begins on the 11thday of the Bhadrab month and continues till the full moon. Putting on fancy dresses, merrymaking, drinking, dancing and singing are all part of the Bali Jatra festival in Orissa. Also spelt 'Karam' the Karama Festival is celebrated by Ho, Kisan, Kol, Bhumij, Oraon, Bhuiyan and Binjhals tribes of Orissa. Not only by tribal communities of Orissa, but the Karama Festival is also a part of the life of aboriginal people in the states of Bihar and Madhya Pradesh. The festival takes place in Bhadrab month during rainy season. Communities go to jungle along with drummers, cut the branches of Karma tree, bring it back to village and then a ritual follows which also include killing of a fowl and offering its blood to the branch. This is much-awaited tribal festival celebrated by the Bondas of Koraput. Sume Geralik Festival begins on a Sunday and carries on for 10 days. The tribal people start with worshipping godlings and demons. Later, the priest performs the sacrificing ritual of animals and birds. Singing and dancing expedition are the fun part of this tribal festival. One unique ritual is the striking of boys (each other standing face to face) with pliant tree branches till the last limit. Next, they embrace each other as the priest delivers a message of friendship and love. All of this happens amidst loud beating of drums. Koya tribal communities celebrated the Bija Pandu Festival. These tribal people inhabit the Koya village, located amid dense forests. The festival begins with worshiping of Godling and sacrificing of animals and birds. As a part of the festival celebration, people go out hunting and fishing to return before dark, while women wait for them at home. A special dance is also performed by tribal men and women, decorated with traditional costumes. An important festival of the Kondh tribe (Phulbani), Kendu festival was known for 'human sacrifice' or 'Meria' in their language. The ritual was, however, banned during the British Rule. The 'human sacrificing' was replaced with 'buffalo sacrificing'. 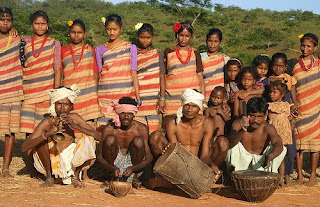 Not only by the tribal people of Koraput, but Chaita Parva is also celebrated by the Bhuiyan tribe of Mayurbhanj, Sudargarh and Keonjhar. Festivities continue for a whole month. Men go out hunting, bring back animals and meat is distributed among all villages. Animal sacrificing is done. People sing, drink and dance whole heartedly. This is an important harvest festival. Maghe Parab festival is the most significant festival of tribes including Ho, Oraon, Kisan and Kol. The tribal festival is celebrated to pay tribute to the village deity. As part of the ritual, a black fowl is sacrificed and 'mahua' liquor is offered to the deity. People wear new dresses, drink, sing and dance together. Its amazing to know that there are such a great number of tribes in India and above all there are some which still follow their age old traditions, even in 21st century. I didn't know about tribal festival in India. Thank u for sharing this. Your style of presentation is very impressive. The meaningful contribution of your mind reflects on those people who are looking for new ideas and information regarding Tribal tour in Orissa. good article to read. I have also a blog on latest diwali wallpapers online.